Co-owners Carol McCall and Sue White.Around the corner from Avenida Del Mar, on a quiet downtown sidestreet, resides a “Steel Magnolias” kind of place. Its spruce green, wooden façade fronts a light, bright, cheerfully decorated interior speaking “welcome” to those who would venture there. In this special place there is a sisterhood, that thing that happens when women gather in common, to bond and build a history together. And history abounds in the San Clemente Hair Co. beauty salon. One maintaining longevity … in the spaces it has shared in town, among its owners and operators, and most importantly amidst the faithful clientele who have patronized the quaint little shoppe these past 20-plus years. Co-owners, operators and partners Carol McCall and Sue White have worked together - first as employees and eventually as owners - since the shop, originally Kay’s Beauty Salon owned and operated by Kay Berger, was located on Avenida Del Mar. To this end Carol and Sue rented their present building, formerly a dental office, on Avenida Granada, and reconfigured it to house five beauty stations, a manicure/pedicure set-up and a massage room. And chuckling in unison, the partners tell of commandeering every available and able-bodied male, female, even grandchildren, willing to chip in and help with the remodeling. If you build it - and it is properly located - they will come … and come they did. Not only the existing clientele but, upon recommendation of many local lodging establishments, visitors and vacationers as well. Telling stories, celebrating joys and sharing sorrows is a great part of what makes the beauty experience at San Clemente Hair Co. so special. Owners, operators and patrons celebrate birthdays, attend each other’s family weddings and showers, and mourn together at funerals. Many of the salon’s clients have been coming to the shop, bonding, and sharing their stories since its inception on Avenida Del Mar in the mid-‘70s. Clients and long-time residents like Wilma Bloom, Maxine Beasley, Jesse Bonkowski and Katy Tomalin. 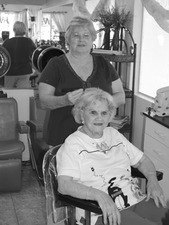 One-hundred-one-year-old, Marvel Murray, who still lives on her own, comes in for a “do” once a week like clockwork. And generations, grandmother to grandchild, like Daisy Darling, Mrs. Kirkwood, and Jeanne Snider seek their grooming there. 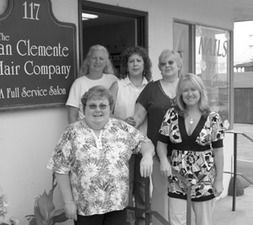 Although many of the clients at SC Hair Co. are more mature, the salon services customers of all ages, male and female. They offer hairstyles and cuts for everyone, ranging from the lady-like styles of the ‘60s, complete with perms, sets, and back combing/brushing, to the more natural, blow dry, curly or straight look of today. Owners McCall, and White, along with operators Haydee Farias and Nam Shandraw do it all. Keeping in step with the times, the salon continues evolving with its products and services. Procreating the shop’s generational bent, Carol McCall’s daughter, Teresa “man’s” the salon’s manicure/pedicure station. Along with the SC Hair Co. clientele, she also preps the rich and famous, those attending the Academy, Emmy, Latin American and MTV Awards and, in her spare time, she also travels to International Beauty Shows held in places like Los Angeles, Las Vegas, and Florida, teaching others her skills. Regular customer, Jeanne Snider, finds it hard to believe that she attended the baby shower held before Teresa’s birth, and that now she receives manicures/pedicures from that once anticipated baby. Permanent make-up and massages are services also available at the SC Hair Co. Massage Therapist, Ginnie Thomas, offers therapeutic massages, and along with the regular clientele, receives many of her patrons as a result of the referrals of local Chiropractor Dr. DeMoss and Therapist Lisa Trevino. It is ironic that McCall and White’s shop should remind customers of the in-home beauty salons prevalent in the ‘40s and ‘50s. For as Carol tells it, her Aunt Vi in Ohio attended beauty school and built a shop in her basement, anticipating that Carol would one day come into the in-home beauty business with her. But Carol’s parents moved the family to California … and the plan took on a new face. The anticipated in-home beauty shop became a little downtown shop around the corner, and the partnership included the next best thing to family, a long -time and trusted friend. Contact the San Clemente Hair Co. at 492-3472.